All travel and bed operations are controlled by a single hydraulic pilot joystick. Maintenance is made easy with segmented sprockets, all travel motors and lowers rollers are sealed. Rear engine covers are removable to easily access components such as hydraulic valves, solenoids, and the engine filtering systems. Powered by large 7.8L clean engine. Overrun and inclination warning systems, and Auto parking brake equipped. Low center of gravity and long crawlers for outstanding stability. Gate lock for added safety. Total machine height of 9’6” for easy transport. Joystick lever optimal for single-handed driving. Instrument panel concentrated on right side of seat. Large-capacity 95 gal fuel tank. Corrosion-resistant aluminum radiator and oil cooler. A 4-segmented sprocket allows replacement without removing the rubber crawler. Bolt-on type lower roller for easy replacement. One-touch front cover for easy opening/closing. Vessel floor constructed of ultra wear-resistant steel. 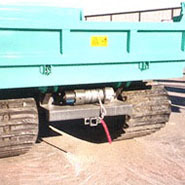 Winches can be added to an size crawler carrier and can be placed in the front and/or rear of the carrier. 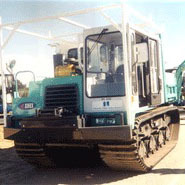 Digger Derricks can be installed on all crawlers. 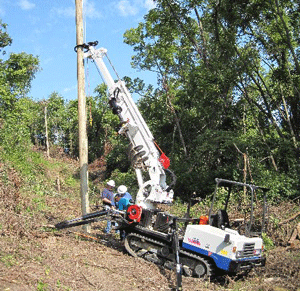 Set poles with ease in remote locations. 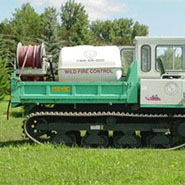 Liquid containers can be attached to the bed for fire fighting applications and also vegetation control. 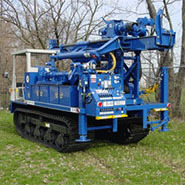 All crawler carriers are available with a seismic weight drop for exploration of gas and oil. We can custom install utility racks to fit any specification. 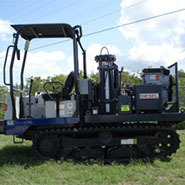 This crawler has been equipped with a drill rig. The bed and cylinders have been removed.